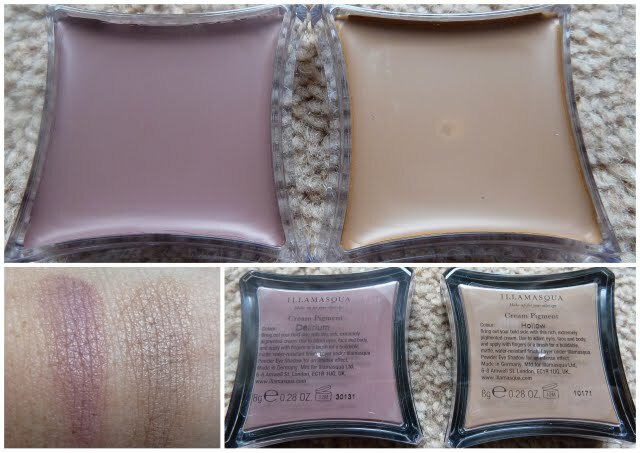 Illamasqua’s latest collection, ‘Toxic Nature’ has been all over the blogosphere recently but having had a play with these pigments I felt the need to blog about them too. For a start, the colours are really interesting – I love how they are a definite ‘Illamasqua’ style take on the usual Spring shades. But it’s the texture of these cream pigments that surprised me the most. Whilst being really creamy, the pigments also feel quite silky/dry at the same time. Not at all greasy – they feel very ‘secure’, like they wouldn’t crease as much as I would expect from a creamy pigment product. Of the two shades I can see myself using Delirium most – as I have a bit of a thing for this sort of murky purple (you just need to see my nail varnish collection to know what I mean). I love how when the pigments are swatched they have a subtle sheen to them. I’m going to use these as eye shadows – both alone, and as a base and see how they fare ware-wise over work day. Has anything stood out from the new Illamasqua collection for you? I’m VERY excited about Hollow and also the orange/coral colored cream pigment. I need to get on it and order them!! are these similar to MAC paint pots? I’ve never used a cream eyeshadow before and Illamasqua has never really jumped out at me, but I’m so intruiged about these shadows. The colours are gorgeous and look like they would blend so well together! very cute blog- I love the layout and the content!Illamasqua is one of my fav companies!